This race is the second most important on my calendar this year, it was my warm up half ironman prior to my most important race of the year, Ironman Canada in August. This is the race that was to test my fitness as well as my nutrition plan. For a couple of weeks before the race I was dreading this date. I knew I was ready for the race physically but was just worn out mentally and emotionally from some tough training weeks and some tough days at work. 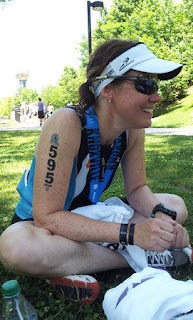 I kept finding issues to worry about and wasn’t sure where to set my expectations for race day. I was excited about doing my first Rev3 race and the race organization and venue did not disappoint. The race swag (headsweats visor and T Shirt) were nice, the expo and check in were fairly efficient though I didn’t have time to look around at all the expo vendors. The Knoxville venue was very nice and everything was within walking distance of the hotel. My IM Canada training mates, Sarah and Monika. 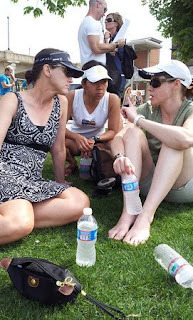 Discussing the finer points of the pre-race meeting and rules. As usual I was up bright and early (4:30am) to get ready for the race but that was OK this time as I had managed to get 7 hours of uninterrupted sleep on Saturday night. Woot! 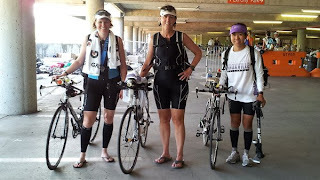 I met my Ironman Canada training partners, Sarah and Monika, in the lobby and we walked over with a former TNT teammate, Renee, to transition to set up all of our gear next to our bikes. One of the things I really enjoyed about this race was seeing all of the other diabetic athletes from Team Type 1 and Triabetes. 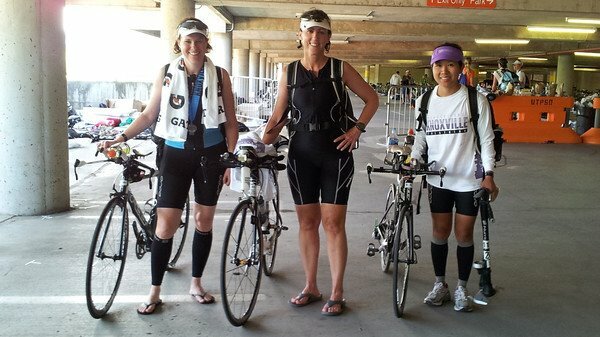 I talked to one of the Team Type 1 athletes, Sebastian, in transition. He asked how my blood sugar was – not good, 310 when he asked – and told me he had been high overnight. It made me feel like I was in a community of others that understood the challenge I was going through on race day – that was pretty cool. I confided to Sebastian that I HATED walking away from my CGM (Continuous Glucose Monitor) when I left transition. Evidently it’s not just me that feels this way. It’s particularly upsetting when you’re walking away when your BG is 310. I knew then I shouldn’t eat anything else but also didn’t want to put in an insulin correction because having any insulin on board when I started my swim could drive my BG very low. So I decided to do nothing assuming it was just my nerves driving my BG sky high. We walked over to the swim start, got into our wet suits, listened to the national anthem and got in line for the swim start. A woman behind me put her hand on my shoulder and said “Are you okay? You are shaking like a leaf”. We had met up with several TNT friends and everyone looked at me. It was funny, I was totally fine. After all the worrying and anxiety, I actually was not *feeling* nervous but it must have been coming out through my tremor. Very quickly we were walking down to the dock and jumping into the water. Monika went to the front and Sarah and I went to the middle with Cristin and Heather from TNT. Then we were off! This swim start was one of the roughest I have been in. It wasn’t particularly crowded but everyone was a little combative to get their line at the start. You would think that would freak me out – but it doesn’t – I just put my head down and keep going until I get some breathing room. Once things cleared up I tried to just concentrate on staying in my ‘bubble’. Racing my race and not getting caught up in what others were doing around me. When we started the race we first headed upstream to a series of buoys, it seemed like that set of buoys came up pretty quickly and I got into the typical light scrum of people getting around the buoys. No problem, again just a matter of getting back into my bubble. I was swimming right next to another woman for quite a while, almost shoulder to shoulder. I don’t like that feeling so I tried to get away from her several times but couldn’t manage to quite separate from her. I felt like we were headed for a collision at some point and sure enough I felt my right hand make contact with something hard as my arm was entering the water. I think it was her goggles. Oops! Further reinforces that I don’t want to swim quite that close to someone. At some point I realized that I was making fairly good time though I wasn’t wearing a watch to track how I was doing. I just knew that for once I wasn’t doing this swim in ‘sections’. Usually I end up pulling up out of good swim form every 500 meters or so. This time I only did that twice – when I rounded the buoys and when I gulped a lot of water fairly close to the end. Quicker than expected the dock came into view and I lifted myself up out of the water. Pretty good swim! Only 8 minutes slower than my Augusta time which is incredible considering that the river in Augusta has an amazingly strong current and this one had none. What I could improve on: Kicking – could feel myself falling into bad habit of ‘pedaling’ the water. SO happy to be out of the water! 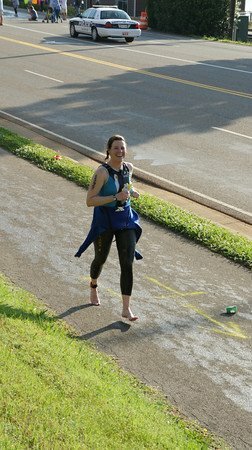 I wrote off transition times long ago, and a good thing I did as it was roughly a quarter mile run from the swim finish to our transition area. Checking my blood glucose in transition is a must so there is no point in trying to scramble to go fast as I will just get worked up and not be able to accomplish my blood check in a timely manner. BG check in T1 was 84 – just shows you what can happen in a short time when adrenaline and exercise are involved. I struggled with the wetsuit a little bit too - so, yeah – 9:44. It is what it is. I knew this was going to be a tough, hilly bike and the promise was more than fulfilled. This isn’t exactly the course that I am best suited to – shorter climbs and more rolling terrain are more my style but this is definitely a lot closer to what I am going to see in Canada. I was most concerned before the race that I not slack off on the bike so I had my zone 3 heart rate written on my forearm and made sure that I never fell below it. I definitely didn’t, if anything I stayed in zone 4 a great deal of the time. I chatted with a couple of the guys I rode next to a good deal of the time, I would pass them on the climbs and they would pass me on the descents. The only true mistake I could point to was having to stop for a few moments to switch one of my water bottles from the back of my bike to the front of my bike. Around mile 38 I could definitely feel the fatigue setting in right before I encountered a long, gradual climb that wiped me out. I got a good lift on the out and back portion of the course when I saw my training partner, Monika, and some other former TNT teammates. Unfortunately I probably put a little too much oomph into trying to get closer to them and suffered when I got to another long climb at mile 45 and then another short, steep climb at mile 52. At that point I was very done and ready to be off the bike. I managed to average 17.1 mph according to my bike computer. I wish I would have done a little better but not having ridden the bike course before I couldn’t be sure how to gauge my effort across the course. What I did well: First time ever – I didn’t have to take a bathroom break on the bike and I never totally slacked off. What I could improve on: Know the course – I could have gone faster on this course had I known the best places to push it. Blood glucose check – 72. Not exactly where I wanted to be, so I spent some extra time sucking down some gel in transition as I got ready for what I knew was going to be a HOT run. As soon as I came out of the garage where we had transition I knew just how hot this run was going to be. Someone had told me at the expo the day before that there was a lot of shade on the course but I didn’t see any shade for roughly the first couple of miles. While I didn’t feel great, I obviously felt a lot better than most everyone around me as I started passing people quickly that had already resorted to walking. I had a plan for this run that involved very quick small steps, salt pills every hour to help with electrolyte loss from swimming, and water and ice at every single water stop. The plan went really well until I started hitting the hills on the course. Seeing everyone walking those hills made me lose a little heart. I made it up and over the first few hills but once I got about 3.5 miles into the course I began to wish for the sunny portion of the course again because at least there weren’t any hills. Not long after that point we got to a truly brutal looking uphill that I knew was pretty long because there were people flying down it who were completing their race. This is where I first began to feel a little bit defeated as there was no chance I was going to be able to shuffle up that hill or even quickly walk up it – it was steep and it hurt. At the top I knew I was in for a very tough next 6 miles on an out and back through a hilly neighborhood so I grabbed a handful of ice to put in my sports bra and began what I knew was going to be a long slog. Your body and mind begin playing tricks with you at this point of a race. My lower back hurt in a way that I rarely feel, and my right hamstring kept threatening to cramp. I twisted my ankle at one point and kept thinking about how much I wanted this to be over. The walk breaks began happening on up hills and got a little slower with each break. This is when I knew it was important to get my mind right as this feeling is typically mental. The pain is real but it is only temporary, one thing you can count on during a race or a workout is that no feeling is permanent. If you are feeling bad it won’t last… and if you’re feeling good that also won’t last. J It is important for anyone doing endurance events to recognize that this is the case and to battle through it. It was touch and go for about 2.5 miles but I managed to battle back and get my run going again. It still wasn’t pretty but I started managing to pass a few people again rather than getting passed. I also saw Monika again on the other side of the road which made me happy and gave me something else to focus on for a few minutes. I finally made it to the turn around and slogged it back to the top of the hill point that marked a little less than 4 miles to go. I made my lone bathroom stop of the day, got more ice and started down the hill. It got brutal again when the downhill beat my quads and back into submission again. Cramping threatened me again and my mind began to wander. It took a lot of will power to keep shuffling from water stop to water stop where I allowed myself to walk. At one point I got to an uphill and decided to start walking but quickly realized it felt no better to walk than it did to shuffle/run so shuffle/run it was. Again, it was pretty sad out there with a lot of people struggling to finish their day. Seeing that there were still people heading out on the run course at this point made my heart break for them. There was very little crowd support out on the course so I tried to cheer people on when I had the energy and heart to do so. Finally I approached World’s Fair Park and got into the last mile of the course. I began to see friends and got that last bit of excitement to get across the line. What I did well: Fought through some hard mental moments. Kept my feet moving for the most part. What I could improve on: Do the above even better for Ironman. Really pretty happy with this and just as important as swim, bike, run for a diabetic!! It would be nice if I hadn’t started quite so high but that appears to have been a result of adrenaline driving my glucose levels up. I went through almost a full container of gel on the bike (approx. 5 servings), 1 pack of Powerbar gel blasts, 2 bottles of Ironman Perform Lemon/Lime, 2 bottles of water, 4 gels on the run, countless cups of water, and a few pretzels. Whew – so I was really eating. I only had to make one small -15% basal rate adjustment on the run for a couple hours. So I can’t be disappointed in that overall time. I definitely wonder if I could have done better on the bike. My only battles on the run were with my own mind. All in all I think this bodes pretty well for Canada if I keep my mind strong and focused at the task at hand. 14 weeks to Ironman Canada! Picking up our bikes after the race - we all had a pretty good day! Sarah even finished second in her age group. GREAT job! So proud of you ladies, and I am in awe of you and the hard work you've put in to get here so far. You rocked it!